Savory Pork Chops, Marinated and Grilled, Thyme for Cooking summer recipes. 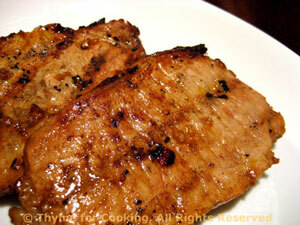 The marinade adds a zesty flavor to the pork and helps keep them tender as they cook. Remember, slightly pink is okay, too done dries them out, and makes them rather tough. Mix all ingredients for marinade. Spoon over chops and let marinate for 10 - 20 minutes. Cook on barbecue for 5 - 8 minutes per side or until done. Baste both sides of chops with marinade once when turning. Slightly pink in the center is perfect. Take a peak (techniques) if needed.